Close your eyes for a second, and travel back in time with me to October of 2016. I was at a networking event–surrounded by movers and shakers, eagerly making my way from panel to panel, and doing my best to figure out how to get on the same level as the speakers I was watching. I was feeling frustrated that no one saw me as a big deal. People would just look past my head as we spoke, looking for a speaker to run over to ask for a selfie with. It sucked. I spent all that money to go to these conferences and no one took me seriously. I didn’t get any clients from it. I just felt those feelings from high school and being excluded from the cool kids group flair up again. I know what you’re thinking–sounds impossible–but I was talking to my now good friend Eric Yang. He moved to the United States from France after dropping out of college, and built a 6-figure networking event before his 21st birthday. He also created the biggest online summit to-date for millennials that brought together 40 world-class experts under the age of 35. Talking to him, I felt like we were long lost friends! He’s one of those rare people who is always looking to give value more than he takes–and he suggested I write a book to really establish my expert positioning in my field. I knew that I knew what I was talking about, but how can others know unless you show them, right? So when he said some of his friends had hit best-seller on Amazon and I could too, I actually believed him. Then reality dragged me back. I didn’t really have an email list or big audience. My podcast was getting okay downloads, but nothing to brag about…and only a minuscule percentage of listeners take action on anything you say. 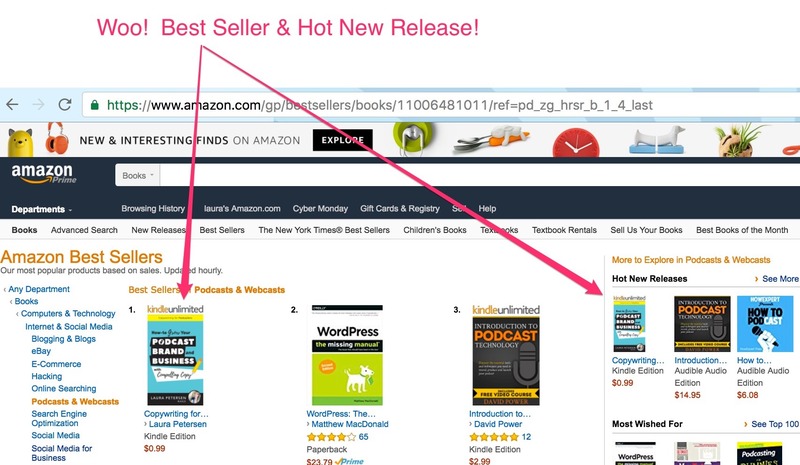 Plus, not many people are dying to buy a niche book on “Copywriting for Podcasters”! Fast forward 1 month and I was staring at my screen in shock at the Amazon #1 Best Seller label next to my brand new book. And not just in the US–in Canada, too! And I didn’t make it happen with pixie dust, connections, or cash. It’s just a matter of knowing how the Amazon algorithm works, and using it to your advantage, plus being willing to put in some elbow grease with fun ‘attraction based marketing’ tactics. And that’s what I’m going to share with you today! Do you know how the New York Times chooses their best sellers? 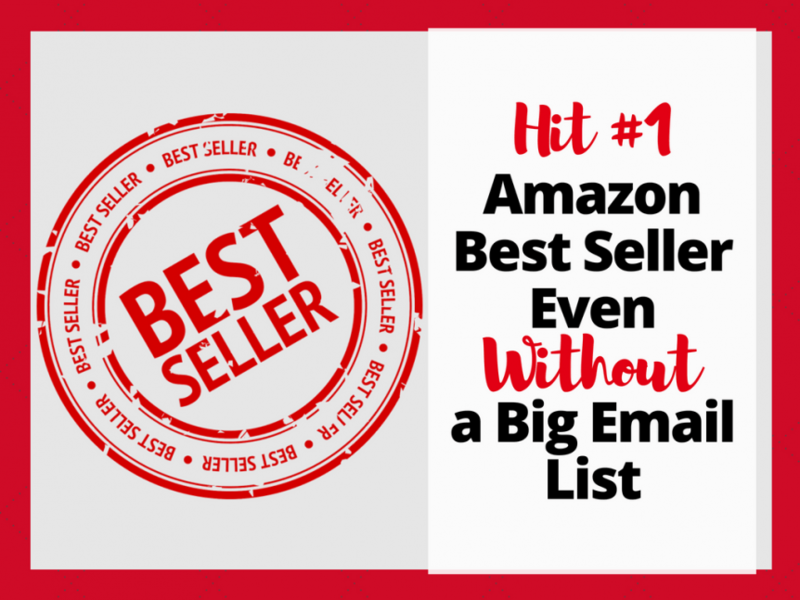 This section clears up common misconceptions about best seller lists, and explains how Amazon’s ranking system can work for you. How do you get an orange best seller badge? Or find out how many sales your competitor had last month? This section dives deeper into Amazon’s secret sales data and their locked-down algorithms to give you some tools to work around them. 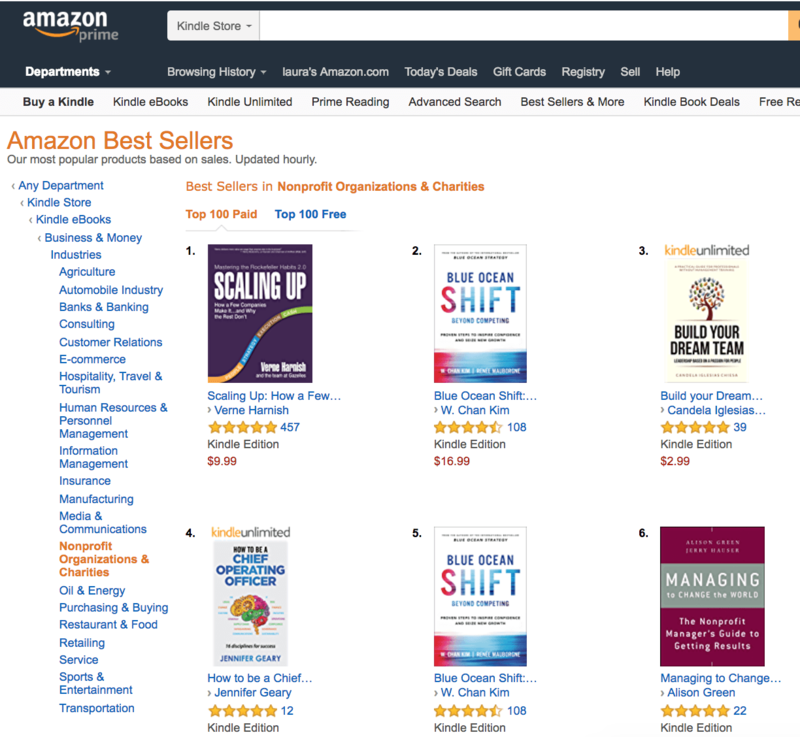 Are you confused or unsure if your subcategory will get you to #1 Amazon Best Seller? This section outlines a foolproof process for methodically choosing a relevant, non-competitive subcategory for your book. You’re probably wondering just how many sales I made to hit Amazon #1 Best Seller. Our final ‘definitive guide’ post in this series will cover leveraging your book for more media, brand authority, and sales. If you missed the most recent one–about how to design a book cover—click here to read it! 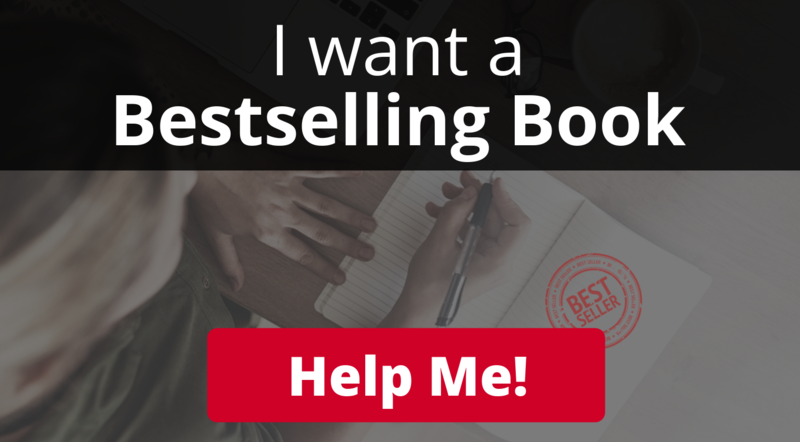 When I first thought about becoming a #1 Best Seller, it seemed like an impossible dream. Didn’t that mean I’d need to sell millions of copies to outrank all the amazing, top-notch best-sellers including works from Tim Ferriss, Gary Vee, and Oprah in non-fiction and famous novels from J.K. Rowling, Dickens, and Cervantes in fiction? If you look at Wikipedia’s dynamic list of the best selling books of all time, you start to get a sense of how difficult it is to actually track the most-sold books. But then best seller lists on their own get…even fuzzier. It might seem like they’re put together in a vacuum that’s perfectly objective. They give off an air of authority. Surely the #1 slot on the New York Times best seller list was filled by the best possible book of the current cultural moment, right? But wait, then what about the Wall Street Journal’s best seller list, USA Today’s best seller list, or Publisher’s Weekly’s best seller list? Why aren’t all those #1 books the same, if they’re all national lists? The thing is, with all these lists, they’re put together by people. And we all know that people are biased. Let’s focus on the New York Times best seller list as an example for how these lists tend to work. It’s unclear if the “thousands of diverse selling locations” are the same as “the panel of reporting retailers,” but I have a hunch the actual panel is much smaller. They update their rankings every week, and it’s not uncommon for people to buy their way onto the list–or the other major lists, like Washington Post or USA Today. First, and most importantly, Amazon’s Best Seller List isn’t manually decided by people. It’s algorithmic. Second, Amazon Best Sellers are category-specific–and, more accurately, subcategory-specific. That means to be a #1 Amazon Best Seller, you don’t have to outsell everyone in the “Biographies and Memoirs” category, or even everyone in the “Professionals and Academics” subcategory. Your focus would be 3 tiers down–on the “Business” subsection of the “Professionals and Academics” subcategory of the “Biographies and Memoirs” parent category. The narrower you get, the less competition you’ll have. And, thus, the fewer sales you’ll need to top that subcategory. But once you click on the product details, you can see which subcategory it’s actually “Best Selling” in. 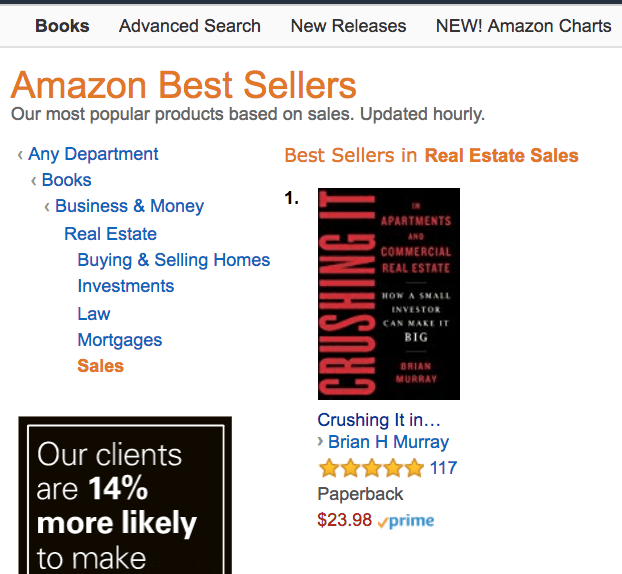 So, this book is ranked #1 in 3 subcategories under Real Estate, under Business & Money, under Books. 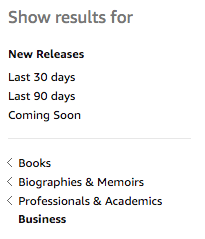 Third, not only does Amazon count its best sellers in these narrow categories, but it also updates every hour. Why? Amazon wants to show its customers the most up-to-date and relevant information possible. So maybe you think you couldn’t outsell Sheryl Sandberg (the COO of Facebook)–and you’re probably right (at least right now, as you are building your brand). But release your book on a slow day, when no other major releases are planned, and chances are that for ONE HOUR, you could outsell the other books in your category. This isn’t “most sales over time,” either–it’s calculated with recent sales. So if, during the last hour, 25 people bought your book, and 13 people bought a different book, you’re coming out on top–even though the numbers you’re playing with are small. 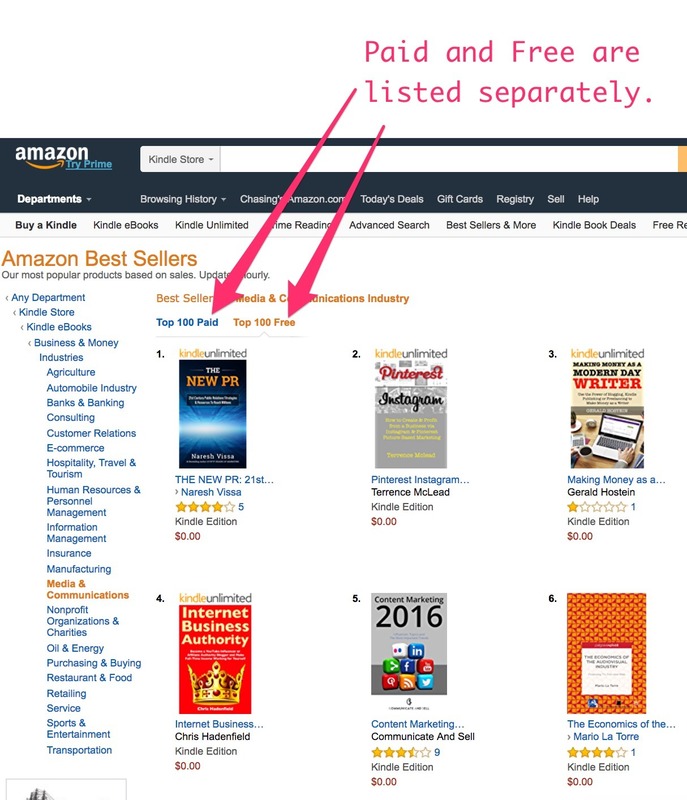 Third, paid and free books on Amazon are weighted the same–but they have separate best seller lists. So if you’re selling your book for $2.99, you don’t have to worry about someone giving away their book for free and taking over your slot. They haven’t come out with any official statements about this, so this is just my humble guesswork. But on other best seller lists, including the New York Times, books are treated as capital-B Books. Fine works of literature, carefully crafted, set apart from, like, sneakers and smoke detector batteries. Their more competitive best seller lists. If you spend a little bit of time looking through Amazon, you’ll start to notice orange “#1 Best Seller” badges below a lot of the book titles. “Please know, in order to receive the Best Seller badge, the product (ASIN) [Amazon Standard Identification Number] must have a minimum number of sales over a period of time to be eligible for the badge. I’m sorry we are unable to share this threshold. A minimum number of sales over a period of time? Thanks for narrowing it down, Amazon! Like most giant corporations, Amazon doesn’t want you to know the nitty-gritty details of the business. If you’re an Amazon author, you can see reports of how many books you sold–but you can’t see the sales data of other authors. But if that’s the case, how can you find out how many books someone had to sell to attain best seller status in their subcategory? Enter: third-party Amazon Sales Calculators. JungleScout and AMZScout both have methods of reverse-engineering the Amazon ranking algorithm to estimate about how many sales you need to get to a particular rank. With these calculators, you pick a category (unfortunately, you can’t get more specific than “books”), and then type in the ranking of the product you’re curious about. Wait, #34? Yep, you read that right. That being said, even as you get up into the ranks of #7,000 and above, the estimates only get down to about ~300 books/month–which is still 10 books a day. Certainly nothing to sneeze at, or to expect on your first publication. All this to say, these third-party calculators can be more helpful than NOTHING–but take their estimates with a grain of salt. Amazon also has more competitive Best Seller lists that you can keep your eye on. This is just if you’re worried that being associated with Amazon in general will hurt your reputation. Because, wait, if the #1 Best Seller title is so easily gamed, will it do more harm than good for you to add that line to your resume? Here’s my take on it. You’ve gotta start somewhere. That “somewhere” might as well be #1 Best Seller in your subcategory, for as long as you can keep it. If that’s an hour? Fine! It’s all about building gradual momentum. And it still takes effort. So damn the haters and go for it! If you want, there are other lists you can gradually work your way up to, like the Amazon Monthly 100 (detailing the books of every category that sold the best for the entire month) or Amazon’s Author Rank. But there’s one big reason you shouldn’t start out aiming for those–I don’t want you to get discouraged and give up! It’s like making a student film, and hoping it wins the “Best Picture” Oscar immediately. Do you know who’s #1 on Amazon’s Author Rank? J.K. Rowling. Know that, and then adjust your own expectations accordingly. Plus, if you are an entrepreneur or someone who wants to gain more business credibility, the actual number of sales of your book is just ONE of about ONE HUNDRED ways you can leverage the heck out of a book, ‘best seller’ or not. A book is one of the best multi-purpose marketing tools and instant authority building blocks out there still today. So, if your only goal with a book is to get a bunch of sales, I truly believe you are missing the bigger picture. My best advice is to write a book, get it out there, do a ‘best seller’ launch push on Amazon, grab screenshots to share with pride and then keep leveraging that you are an author near and far (we’ll talk about how more in depth in a future article!). 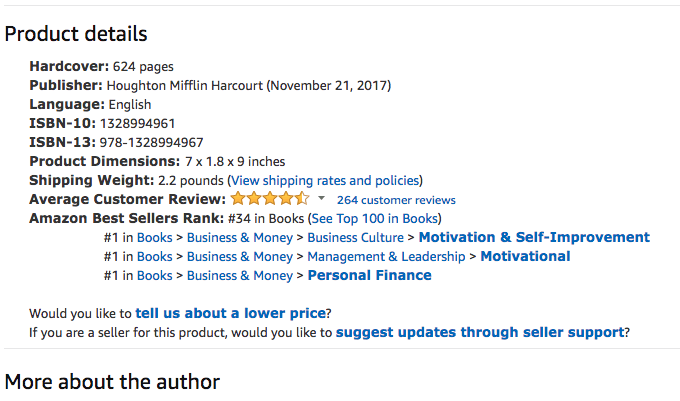 Like we saw above, Amazon ranks best sellers by subcategories (as well as parent categories), so it actually wouldn’t even make sense for my Copywriting for Podcasters book to be in the same category as Tim Ferriss’ Tools of Titans, which actually released the week right after mine in 2016. I discovered that if I could find a subcategory that was relevant to my book but also relatively less competitive than other categories, I could sell fewer books and still have a real chance at the title. In my research, I heard stories of people doing scammy things like publishing their books in some obscure category even though it had nothing to do with their book just so they could sell a really small number and say they were a best-seller. But I refused to do anything shady. I wanted to be seen as a professional, and I’m in this for the long game. Instead, I put in the time to research and analyze categories as best as I could, marketed to my 1800 friends on Facebook and in some groups I was a member, and rolled the dice. Here’s my foolproof method for researching your subcategories so you find the best possible one for you–but before we dive in, know that Amazon only lets you select two subcategories. Cool? Cool. So, here’s the subcategory research process! To find a relevant subcategory for your book, try this exercise. Go to the Amazon Bookstore (and the Kindle Store) and “look” for your book. Imagine you’re a customer, trying to buy your book about using meditation and mindfulness to get clear on your entrepreneurial goals. Scroll down the sidebar and take a look at the full list of categories. To find that book, you might look in “Business and Money,” sure, or you could look in “Religion and Spirituality.” But while both of those are related to your hypothetical book’s themes, neither really gets to the core. You’re not looking for a book on entrepreneurship, not really. And you’re not looking for a new spiritual practice. If you’re looking for a book that uses mindfulness as a way to make your goals sharper and clearer, then what you’re looking for is a motivational, instructional book. A self-help book. So “Self-Help” might be a good place to start. Once you choose your parent category, take a look at the subcategories. Where would you look next? Maybe “Motivational” or “Success.” Repeat the process until you get to a place where you, as a pretend customer, would expect to find your book. Let’s say your book is about social media marketing. Where would you look for that? If you click “Marketing,” it takes you to “Web Marketing”–a nearly-exact fit for your book! If you click “Advertising,” you get much broader results, and you’ll also see some big names you’ll be competing against; like Seth Godin, Malcom Gladwell, or, uh, David Ogilvy (an ad copy God-like figure). But what if you start with “Computers & Technology”? Well, immediately, one of the options is “Internet & Social Media.” And if you click it, you’ll see “Social Media for Business”–another exact match! But even though it’s an exact match, once you get there, you’ll see the best seller is Gary Vaynerchuk–not a super-easy guy to unseat. Though, again, not entirely impossible, because Amazon updates their rankings every hour. Maybe he’ll have a slow hour. 😉 The key is to make sure you’re not releasing your book at the same time a marketing giant is releasing one, too! To get deeper with your research, step back and think about your target audience. What are they looking for? Where will they likely want to click? Those are the subcategories you want to target. Getting inside the heads of your target customers are what marketers spend all their time trying to do. One good technique is to make a “Buyer Persona”–a fictional avatar (based in reality!) of the sort of person who would buy your book. And if you’ll remember from the very first blog article in this series, one of the big goals with your book in the first place is to attract potential clients, so this is your chance to really focus exclusively on your ideal client! Who are the current customers/clients you want more of? THIS is your buyer persona. How old is your target customer? What’s their biggest problem right now–what really frustrates them? What makes them feel strong and capable? You can make it up, to some extent. Just think through it, logically. It’s like building a character for a novel. If you already have business experience in the niche you want to write for (like you should), then you have already engaged with your idea audience — clients and customers! At the very least, start with a question you can definitely answer–what does your target customer want? They want whatever’s in your book. Your book, in this case, offers a way to get clear on entrepreneurial goals. They want to be an entrepreneur, and they want the process to be clear and intentional. That springs off into other character traits that line up. Maybe that means their biggest problem is lack of clarity. Maybe too many things are going on, and they feel cluttered and unsure. Perhaps if they feel cluttered, they have a demanding (but unfulfilling) corporate job and they’re trying to start their own business, but they’re just so busy that they don’t know how to make it work. If they have a job like that, they probably make a decent amount of cash, and they’re probably not 23. Mid-30s, maybe. They’re looking for emotional fulfillment, not a get-rich-quick scheme. They want their business to bring clarity, calm, and meaning to their life. Underneath these parent categories, where would this customer go next? If you click through these categories, you’ll notice that most of them–aside from “Entrepreneurship”–aren’t over-cluttered with business-related books. And yet, this is probably where your target customer for this hypothetical book will be looking. The key is to put yourself in a subcategory that your target customer will be looking in, that also relates to the core themes of your book. A fairly quick, simple method to finding the right subcategory for you is to look at another book that’s somewhat similar to yours and seeing where they’re listed. The only way this could potentially backfire is if they’re a much bigger name than you–and then, to get Amazon #1, you’ll have to outsell them (but I’ll show you how to check for that next). Duh, right? If you’re trying to hit Amazon #1 Best Seller in the Cookbook category, you wouldn’t go head-to-head with Martha Stewart. You want a subcategory where you can attract your target customer and also not have to compete with the big dogs. Who’s listed as the best seller right now? Are they a big name? If you click on the best seller, what’s their overall Amazon rank? 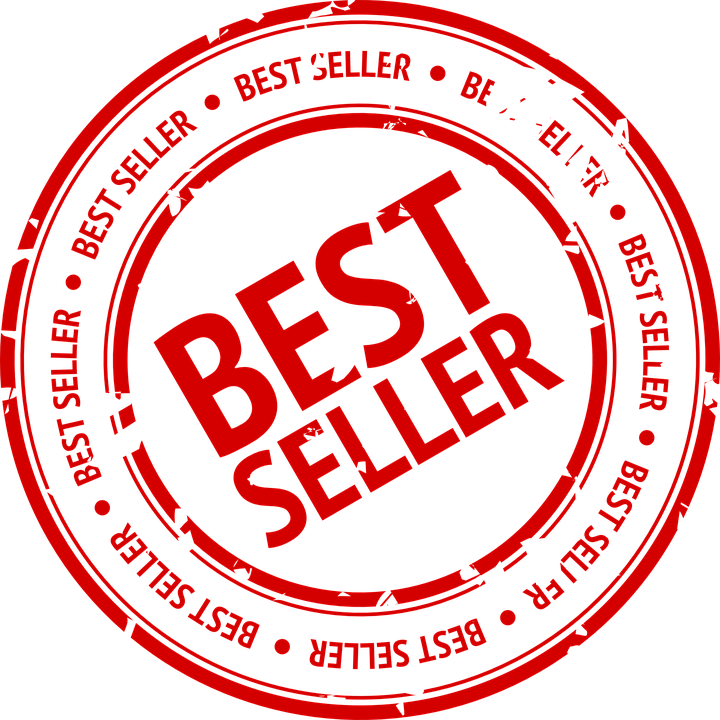 Is it lower or higher than the best seller rank in the other subcategories? You want to know which subcategory you should pick between the two. Great! Let’s click on the current (as of 1/1/18 at 5pm PST) best selling book in each of these subcategories Turn Your Computer Into a Money Machine in 2017: How to make money from home and grow your income fast, with no prior experience! Set up within a week! and Scaling Up: How a Few Companies Make It…and Why the Rest Don’t (Rockefeller Habits 2.0) respectively. Now, let’s analyze what we see. Both books are currently #1 in at least one category. And the first book is ranked #1,963 in all of the Paid Kindle Store. Whereas the second book is ranked #11,922 in all of Paid Kindle (remember Tim Ferriss was #32 earlier?). Because Scaling Up is “only” #11,922 overall, but #1 in the subcategory. Essentially, it’s not doing THAT crazy well on a big scale, but still locked in the top spot of this category. If I were releasing my book and had to pick between the subcategories of “Media & Communications” and “Nonprofit Organizations & Charities” right now, I’d pick “Nonprofit Organizations & Charities” without any hesitation. I can’t tell you how many sales you’d need exactly to hit #1 and beat out Scaling Up, but I can tell you that you’d need far fewer sales than you’d need to beat out Turn Your Computer Into a Money Machine in 2017. Putting in the research to compare subcategories like this is tedious, time-consuming, and (in my expert opinion) completely worth your time and effort. Plus, this information is public and free. No apps, programs, or payment needed. After you’ve done your research, choose your two categories, lock ‘em in and roll the dice. 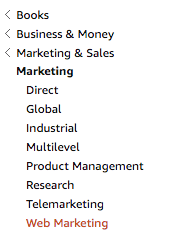 Important Note: My clients (and I) are often frustrated that once we find perfect categories on Amazon, we head into our accounts to select the categories and — wtf!? — the exact options are not available for selection. It’s scary and frustrating. Go into this knowing that! However, you will be able to hunt down as close a match as you can. And, you are also allowed to email tech support to request placement in a category if you need assistance. Oh, and which categories you end up showing up in can change even inside of a day! But just have faith in the Amazon elves and bots that your book will be placed accurately. And, if you need help, reach out and ask. This research has been one of the key factors in my own book’s and all my clients’ books success in hitting #1 in their categories. (For a current list of success stories, check out my running Wall of Fame from past clients — can’t wait to add YOU to the wall!). Okay, okay. So after all of this, you know how the Amazon Best Seller rankings work. You know it’s not as competitive as you might have first assumed. But what about my story? You already know that I hit #1 Best-Seller in both the U.S. and Canada for my book. It was in the “Podcasts & Webcasts” subcategory, so I can proudly say that it’s relevant to my book. But how many books did I sell to earn my coveted title? What? 33 hundred? 33 thousand? 33 million? And now, you’re probably dying to know to know–is that it?? Just 33 sales and anyone will hit best-seller!?!?! Well, the answer is…it depends. Dammit, that’s always the answer, isn’t it? But just knowing that I had only 33 sales gives you some hope, right? Yes! It’s not an impossible dream! It’s not a 100% guarantee, but if you do everything I teach you, learn from case studies of others like you, and stop procrastinating, you have more than a real shot at a #1 spot. And if you hit “only” #3? That’s a Top 3 spot! And if you hit “only” #10? You got Top 10 Best Seller! And if you hit “only” #125? Hey, you are a freaking published author. Pat yourself on the back and let’s go out there and use your book for TONS more in business-building equity. 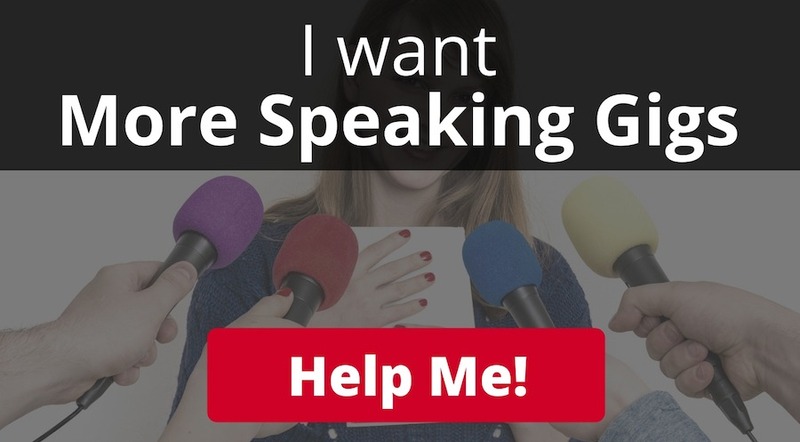 Say “hello” to more speaking gigs, more podcast interviews, more credibility in your industry, and more. Ooof–you’re almost all the way through this series on becoming a #1 Amazon Best Selling Author! I am so HUGELY proud of you, and to make sure everything’s clicking, let’s review the most important points from this definitive guide. Best seller lists don’t count the most books ever sold. Even with big-deal lists like the New York Times Best Seller List, the rankings come from most books sold at specific bookstores in a specific timeframe. Amazon keeps their sales data pretty locked down, but there are third-party apps like JungleScout and AMZScout that give you estimates for your competitors’ monthly sales. If you’re the type who likes to aim high, Amazon also has an Amazon Monthly 100–a list that details ALL the best selling books from ALL the categories over the course of the month. Make sure your subcategory is relevant to your book–otherwise you’ll end up hurting your credibility, and, more importantly, your ideal customer won’t be able to find you! Amazon also lets you select two subcategories, so you can try your luck in the two least competitive ones. So…how many books did I sell for my prized #1 Amazon Best Seller badge? That’s right–33! If I can do it, you can do it. Take 30 minutes and start brainstorming subcategory ideas! Who’s your target audience? Write down everything about them–being as detailed as you can possibly be–and start figuring out which subcategories might be a nice home for your book. And of course, if you have questions or stories from your book self-publishing journey, please feel free to drop me a line–always.